Express consent: individuals must explicitly consent to the processing of their personal data. Transparency: all information and communications related to personal data must be easily accessible, easy to understand and expressed in plain and simple terms. Responsibility: companies are required to take the necessary steps to comply with the law and must be able to provide proof of said compliance at all times. But with recent scandals involving Facebook, the Swedish Transport Agency, Prism or the earthshattering Ashley Madison hacking, you might be worried about what actually happens to your data when it is sent to the mysterious “cloud”. Are GAFAMs true data vacuums? What the giants Google, Amazon, Facebook, Apple and Microsoft behind this acronym have in common is being American and probably knowing more about you than your own parents. They know all your internet aliases, your location, they know who you like and who you hate. They know what you like to do to relax, what you like to eat, how you spend your week-ends and the kind of clothes you wear. Sometimes, they even know how you vote for in the privacy of the polling booth. Of course, there’s confidentiality policies. But are they actually useful? An eye-opening showcase by Dima Yarovinsky entitled “I agree” highlights the length of the terms of service of major US internet platforms (from left to right, WhatsApp, Google, Tinder, Twitter, Facebook, Snapchat and Instagram). The moral of the story is: no one takes the time to read the small print, everyone just clicks “I agree” within a few seconds and GAFAMs greedily gobble up your information. What does data sovereignty actually mean? “We’re coming to the – possibly belated — realisation that we need to rely less on non-European internet infrastructure, platforms and access points. The need for us to have a sovereign cloud is acute”. Fleur Pellerin, French government Minister in charge of the digital economy, 2013. Data sovereignty simply means that digital data is subject to the laws of the country it is found in. Privacy data is governed by national laws, but also by European law, namely the GDPR. This also applies to the data circulating within our borders. When the data leaves Europe, it is subject to foreign national laws. But did you know that, although US giants have built data centres in France or Europe, according to US law, the American government may use the data held by US companies, regardless of its physical location? First, you can choose a European publisher that hosts its data locally. You can also opt for an open source solution, which ensures transparency and complete control over the software. BlueMind is French software publisher that offers an open source solution designed to respond to users’ expectations while safekeeping European data sovereignty. How? We offer Outlook (Microsoft) users the same features as Exchange, in particular in terms of collaboration. In a nutshell, you can continue using all the current features of Outlook’s mail solution. You won’t tell the difference, but your data will be where you want it to be, within a controlled process and with no unwanted data processing. This unique innovation makes BlueMind the only alternative solution to Exchange that offers connector-free Outlook use and with no visible difference to users. 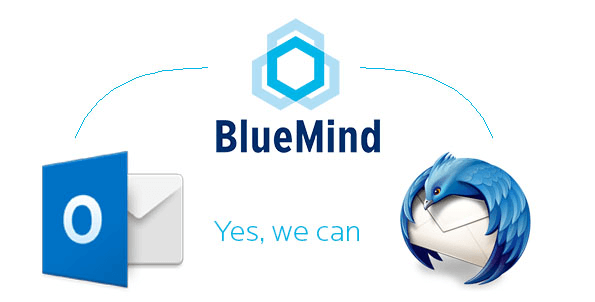 But BlueMind also provides advanced support for other mail clients such as Thunderbird or mobile devices. We therefore offer businesses a cheaper, sovereign alternative that is equally effective as American giants’. “Anyone who might be concerned about their communications being intercepted should then use cloud services that do not go through American servers.” Hans-Peter Friedrich, German Interior Minister, 2013. To meet these requirements, IT departments must turn to a sovereign cloud so that data is stored and processed in Europe and complies with both national and supra-national law (GDRP). Contrary to common belief, France does have the infrastructure, the means and above all the desire to break away from American giants. Next Next post: BlueMind manages your email signatures!